If you’ve continued your usual run schedule the past couple weeks then you know that the heat and humidity have been brutal just about everywhere in the the good ol’ US of A. To try and beat the heat I’ve woken at 3:20am the past three weeks for all of my mid-week runs to try and get my miles at the coolest time of day. Still, at 4am when I start my run the heat and humidity has been just slightly better and it seems that all I’m doing is removing the sun from the equation. While this is a huge help my experience this morning was that of 84 degrees and 85% humidity which is brutal and performance stopping to say the least. To battle the heat, hydration and recovery are key points to remember. Perhaps a good place to start is to figure out your sweat rate and to figure out how much water you should drink per day so you know the numbers. I am big on knowing your numbers and as I’ve said before, numbers don’t lie. The numbers cut through the emotion, the mental, the physical and the crap! Being armed with your numbers is a great first step toward maximizing your potential. First up is you daily water intake. Check out the Human Water Requirement Calculator to see how much H2O you should take in per day. My number surprised me. Just be honest with yourself when using the calculator so you’re as accurate as possible. Also, I don’t count sugary drinks or even diet soda toward my intake number. That’s a personal choice and a good way to make myself decide/opt for water instead of a soda or juice. Knowing how much you should drink daily will ensure that you are hydrated throughout the day and ready for your next training session! Be specific for the type of exercise you do when calculating sweat rate. If you a want a sweat rate for running then you should run for an hour. You SHOULD NOT lift weights for an hour and then expect that sweat rate to be the same for when you go for a run. You’ll sweat more on a run than you will lifting weights in the air conditioned gym. Speaking of AC, please pay attention to your environment when calculating sweat rate! If you decide to calculate your sweat rate on the treadmill in your air conditioned gym with the two TM fans blowing on you then know that you will sweat more outside on a hot day. Basically, just pay attention to the temperature, humidity and dew point in relationship to human comfort. Finally, if you are becoming more active and losing weight like me then be sure to recalculate your sweat rate on a regular basis as your body will become more efficient at regulating heat and your performance will increase too so you’ll want to make sure you are drinking enough, but also not over-hydrating…not a big issue in the recent 100+ temps, but still something to consider so you aren’t trying to run with a lot of extra fluid sloshing around in your stomach. 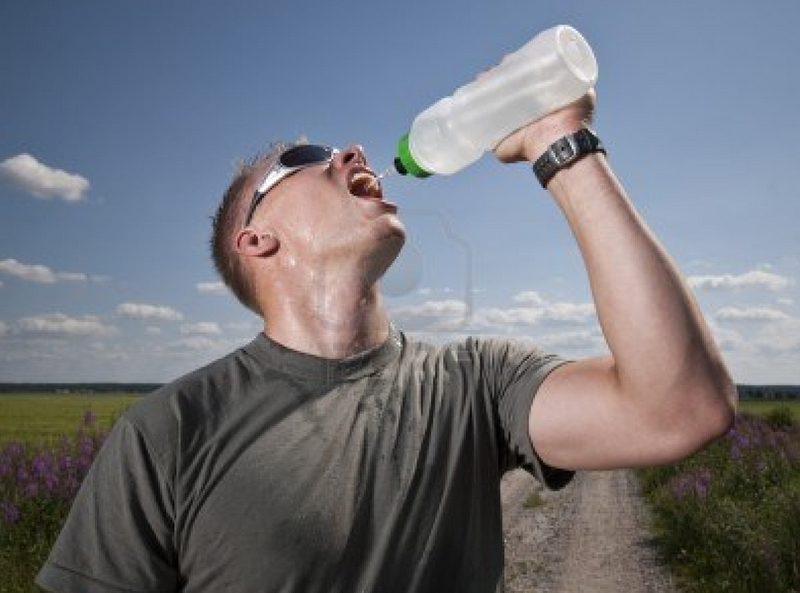 Stay hydrated and stay safe on those hot runs! So there are only a few days left until the big event. 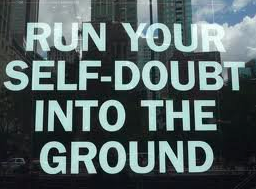 You’ve trained relentlessly (at times) for your [insert your race distance here] and you are ready to go!! ….but now come the voices of doubt. You know them all too well and they can strike at any time including both before and during a race. You’ve even heard them before while training. The voices are fueled by self doubt, lack of confidence, good old fashioned worry, and a host of other things that may or may not be real except when those voices start whispering. They are silent at times but are always sitting there on your shoulder right or left (right for me). They can get down right nasty at times too! I think mine drinks. 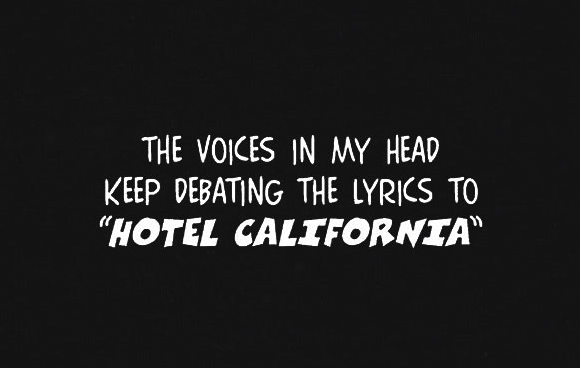 I realized some time ago that the voices never go away…they just get a tad bit quieter over time. I’ve also compiled tips for combating these infernal conveyors of bad tidings. I call it “My Ten Tips for Combating the Infernal Conveyors of Bad Tidings.” Catchy title right? Train regularly. Have a plan and stick to it! Keep track of your numbers so you can celebrate every victory no matter how small. Weight, speed, distance, time, heart rate, eating breakfast every day…whatever you want to track! Plan your training to be a part of your life not a temporary substitute for it. My day includes training. Doesn’t feel right without it! Practice smiling while you train. <– This one small act may be the most important. Do this especially when you’re having a rough go of it during a training session. I always smile any time I run over 10 miles…can’t help it. Tell people about what you’ve got planned. It’s amazing what you can do when you’re accountable to others. This is an actual technique used by professional athletes. Tell yourself how awesome you are…try it now. Feels good doesn’t it!?!? This is another technique used by professional athletes. See yourself crossing the finish line. Have multiple goals for an event. A PR is nice, but won’t happen every time. Enjoyment CAN and SHOULD be a goal. Consistency can be another. If you run a half or 5K at the same speed two years in a row then you’ve maintained a good level of fitness so congrats!! Have a planned routine for race day. I call it my “pre-game”. Stick to it! 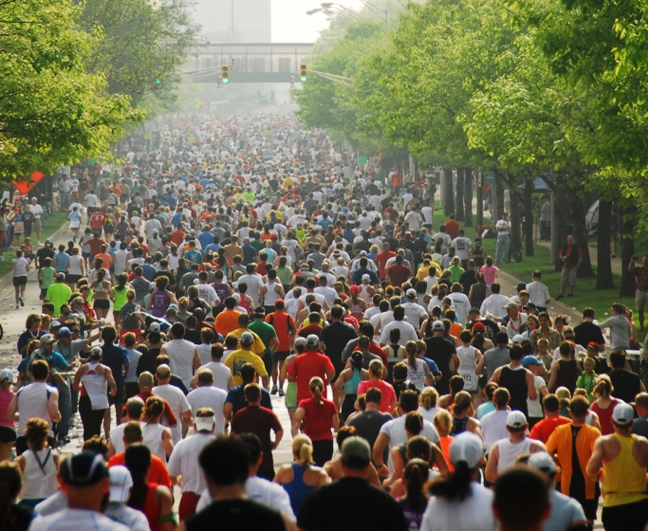 There are 20,000 other runners who are also in no danger of winning the race. We all get the same medal and nearly every one of those 20K will say, “congrats” when they see it hanging around your neck. I will. You do the same! This one is a little strange. At some point the voices will come calling…they always do. My advice is to have a reply ready. Mental preparedness goes a long way to putting a muzzle on self doubt. The time has come to make the packing list for the 2012 Disney World Marathon Weekend! This year is a bit different for me since I’m packing for not one, NOT two, but THREE RACES! I must be well…..Dopey! Running Waivers x2 – I can print them at the Expo, but why have an extra step…I want my BIBs NOW! Running Shoes x 2 – A single pair may not be dry by the time the marathon rolls around at 3am after completing the half the previous day! WDW Radio Running Team Shirts x3 – Gotta Represent! WDW Radio Running Team Bandanas x 3 – Still Representing! Running shorts x 3 – A little extra warmth and wind resistance…down there. Body Glide – A must for multiple races! EAS Shakes x3 – For recovery…of which there is very little between these races so nutrition is extra important! iPod arm case – I’m not carrying it for 42.4 miles…it’ll get heavy! Knee braces x2 – What? I’m not superman….it’s 42.4 miles!! Ibuprofen – For Monday….and the rest of the week too. Large Trash Bags x 3 – For extra warmth – Hefty Hefty Heeefty! Sport watch or GPS device – If you so desire! Ok, if I sat here longer I could probably think of other things to add to the list but these are my minimums for MY trip. Hope to see some of you down there at Disney either running beside me or cheering me on as I run by! I’ve been training non-stop since December 2009 for some running event or another…there have been one or two… Across these last 20 months I’ve improved my fitness level from running nearly a 3 hour half-marathon to a ~2 hour half-marathon and ran my first full-marathon eight months ago. All great accomplishments. My whole focus besides proving I could do it was to just “get in shape” and lose some weight with an emphasis on weight loss early on. I quit weighing myself as often a few weeks ago and checked in again yesterday afternoon with my friend “The Scales”. On Thursday I weighed 174lbs! I’m getting so close to my goal weight of 160-165 that I can’t wait, but honestly at this point I’m more interested in my fitness level, body fat percentage and the way I feel more than the actual number on the tell tale scale. I was beginning to wonder if I’d lost some more because my interval runs and tempo runs had been getting easier for the program I’m on at present (FIRST Program). I kept being able to push it a bit more than what was prescribed. Then my trainer saw me Thursday morning and asked if I’d lost some more weight. I actually said, “No”. That I was just looking different because of the weight lifting I’d been implementing twice a week…I’m happy to admit that I was wrong! Never been so happy to be wrong! So take a look at your exercise routine, diet, calorie consumption and calorie expenditure. Are you sending consistent messages or mixed messages? Just something to ponder. My next run, a full marathon, is 92 days away. I’m looking forward to running it at 174 pounds or less! A lot of times when we hit the gym we go for the “more bang for your buck” workouts. Multi-muscle, multi-joint exercises are always being touted as a “Time Saver”, “Calorie Burner” or “Only way to go if you have X amount of time”…. I would have to agree. So I’ve been training for 18 months and my trainer “handed me my hat” so to speak on these small muscle exercises over the course of the hour. I was sweating bullets on the first couple exercises that worked the front of the lower leg. 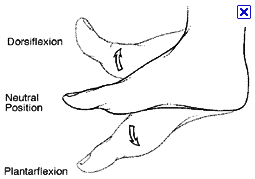 These three little guys are in charge of pulling the toes back toward your shin (dorsiflexion), rolling your foot inward (inversion), rolling your foot back out (eversion) and extending your big toe (extending your big toe…). So these muscles are fairly important to running, swimming, biking, walking, standing, and to a lesser extent bouncing on a pogo stick (actually not sure on the last one because I can’t do that, but I’m glad you’ve decided to come with me on this one). So here I was laying on the floor with a cable strapped to my foot with my foot at a 90 degree angle to my lower leg and pulling my knee toward my head. Basically a knee-up in the supine position (flat on your back). By the third set (3×15) I was barely able to keep my foot from pointing down and letting the cable slip off. It was a LOT of work! This would be a great exercise for shin splints too as it strengthens those muscles. Next we worked on the inner/outer thigh machines which I’ll say that not a lot of guys in my gym use. But when you’ve experienced ITBS like me, you don’t care anymore. These machines hit those muscles and strengthen them so you can help stave off ITBS. The muscles being worked here also support the sides of your knees. Raise your hand if you could use a healthier and more stable knee or two!!!! Ok, put your hand down now…people are beginning to stare…. What’s next you ask? Single leg Romanian Dead Lift with a dumbbell (not me the weight…). Want a strong ankle and superior balance? Do single leg RDLs. In the picture the guy (not me BTW) has his leg bent slightly. This is okay, but an RDL technically has a straight leg. Note that he has a straight/flat back as well. We did a super set on these with a seated row since the big muscle being used IS your back. This also works your core! Triple bonus! WARNING: If you’ve never done RDLs ask a trainer at your gym to model it for you. 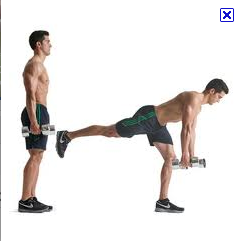 Just call it a single leg dead lift with a dumbbell…a good trainer should know what it is. Use a light weight until you get the form down. We did all sorts of other stuff, but I’ve rambled on long enough so I’ll put the core work in another post. You shouldn’t always isolate the small muscles since you hit them when you work the big ones, but take a single workout every 2-3 weeks to concentrate on the small muscles and you can see some big gains! I’ve written about tapering in the past, but felt it was worth writing about again as I approach my next half-marathon this coming Saturday. I’m running the nation’s largest half-marathon, The Indianapolis Mini-Marathon with 35K+ other runners in Indianapolis, IN. 35,000 runners participate in the Indy Mini-Marathon. The course takes runners around the Indy 500 Speedway track! What prompted this post was all the “taper tweets” I’ve been reading this morning. Many runners are worried about doing too much or not enough in the last 7-10 days leading up to their race. I totally understand dear friends! First off for all my new runners out there you might be asking, “Tapering? What’s that?” Tapering is the final days leading up to your big event when you workout less so as to get the recovery you need for race day. Whether it’s a 5K, 10K, 15K, Half, Full or Ultra marathon it really doesn’t matter. All of these have a little taper time before hand. In my opinion and experience, how much tapering you need depends a lot on your amount of current running experience, the distance you’re going in your event and the number of races you’ve run prior. All of this combined should fit into a plan of what works best for you. For me, I tend to taper for 7-10 days before anything less than a full-marathon. So two weeks out from this half I did a final 10 mile long run. Last Friday I did a 6 miler and primarily rested over the weekend except to do yard work. This week I rested Monday and I’ll do short runs Tuesday and Wednesday. I lifted last week on two days and did a very light (high rep) full body weights routine today (Tuesday). I’ll be finished with any weight lifting after today. Thursday I will go to the gym and do something non-impact like cycling, elliptical or maybe just walking on the treadmill while I watch ESPN. 🙂 Friday I will take off completely (and sleep in past my usual 4:30am wake-up call) since the race is the next day. One big component of my tapering is stretching. I normally stretch after every workout, but I will take a little extra time to stretch my IT Bands, glutes, legs, shoulders and back. Basically, instead of doing 2-3 sets of stretches I will do 3-5 sets adding 10-15 minutes of extra stretching. Many times I’ll also use my foam roller at night to make sure I have all the knots worked out of my legs. As for diet, I don’t change much in the taper zone. 2-3 days out from the race I do eat a little more pasta….mainly because I really LOVE pasta! There is a lot of hype around carb loading, but I’ve read the actual research studies and while stored muscle glycogen (sugar/carbs) is a limiting factor for performance (sorry about the geek speak), the average runner doesn’t get a lot of benefit from carb loading. 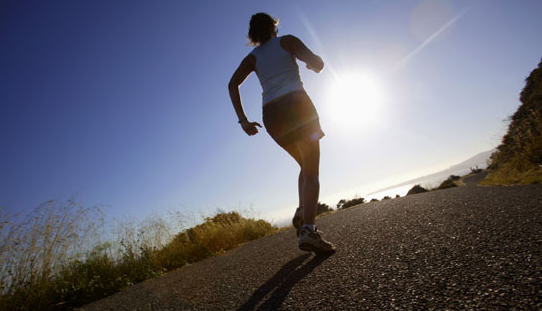 As long as you rest a couple days before an event, your muscle glycogen stores will increase just from not exercising. You’ll also want to replenish during the event/race with Gatorade, gels, etc. at regular intervals. Basically find what works for you and stick with it. Actual breakfast not shown....wrong cereal. 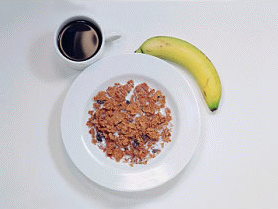 For me, I eat a measured serving of cereal, a banana and a cup of coffee a couple hours before the race. 15-30 minutes out from the start I pop a GU Energy Gel and then continue to take more gels as the race progresses usually every 30-45 minutes. I also use the provided water and Gatorade on the course. I might be overloading on the carbs, but it doesn’t bother my stomach so I stick with the plan. I also don’t have to worry about hitting the wall at mile 11 and crawling to the finish line. Remember, tapering is a good thing! You won’t lose the ability to run long distance in a week…or even two weeks. I’ve even had races where I didn’t workout at all 5-6 days before an event and did fine during the race….including earning a PR by over 8 minutes! I chalk it up to being well rested. Active.com had a decent article on Tapering today as well if you’d like to check it out! Also, Runner’s World had a good article on Recovery days today. Though not specific to tapering it speaks well to recovery which is what tapering is all about! Happy Training and see you on Race Day! Yes, it’s cold outside here in Indiana as we move into December, but that kind of cold is not what I’m talking about. Over Thanksgiving I was able to spend time with friends and family which means being around a lot of little ones, lilliputians…aka, kids. Ahhhh, they can be so cute in their little holiday sweaters. That is until they sneeze on you. That was not the case for me though, no! I was the victim of a rhino-viral terrorist attack. You see the kids LOOKED healthy but hid a dark secret within. As I spoon fed pumpkin pie & chocolatey cake goodness to my GF’s niece & nephew I took a couple bites myself and that is where I made my mistake. Way back in the day I worked fast food and I remember something about transferring germs or something…lesson lost. So the Saturday after “The Attack” I started to have a little bit of a sore throat. My GF who is way smarter than me let me in on the whole rhino-virus formula of 3 days in, 5 days to stay, 3 days out. So Saturday was Day 2 of the arrival. Lesson RE-learned! So why mention all that? Well, I am very sensitive to any type of upper respiratory issue including the common cold so I tend to take a proactive approach (Big Surprise There!) when I feel a cold coming to visit and that day Mr. Rhino-virus was knocking at my door. OJ (Vitamin C) – Morning, after work and before bed. …..no training or limited training. I know, I know….horrible to say, right? Finally, I take Zicam or a generic version of Zicam if it’s a common cold getting me down. Your decision though! Why no/less training with an illness? Ever had a cold that lasted weeks or seemed to last for weeks? I’ve had that and it’s horrible! A single bout of exercise does effect the immune system. Immune response drops or is less after a single bout of exercise. Now if you are a regular exerciser your immune system most likely is stronger than Joe Couch Potato, but the dip in your immune system that you get from a good run may just be enough for that rhino-virus to stick around longer than me at a buffet last year…too long! During the onset of a cold may be the perfect time for you to get a little extra rest and come back recharged after your exercise hardened superior immune system sends out the hunter-killer drones for ol’ Mr. Rhino. So a couple weekends ago I geared up to run outside for my longest run to date. I was pumped, excited, anxious and ready! I had previously ran 17 miles (2 weeks prior) and I was ready to tackle my first 20 miler! 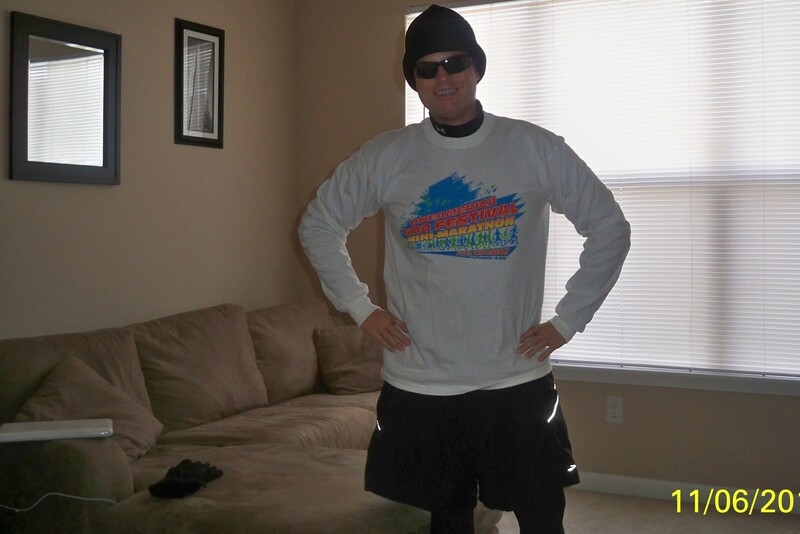 Ready for my cold run and 45 pounds lighter than my 1st blog's pic! I had purchased Under Armour Cold Gear ($100 worth! ), bought a hat, gloves, extra GU packs, running socks and I was ready! Why special Cold Gear you ask? Because it was going to be a bit chilly out in Indiana that Saturday morning. 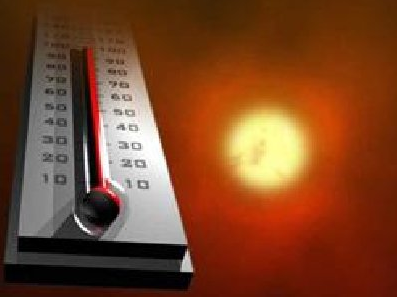 The low temperature was to be 25 degrees with a high of 41 in the afternoon. I grew up on a farm. I’ve gotten up at 5am to feed cattle in blizzard conditions. This felt colder. There was just a slight breeze, but at 25 degrees a 5-8 mph breeze can be biting and it was! I ran down the trail and was doing well. I took a side route to add a couple miles early and then came back to the main trail and kept going. Starting out at 156th I was aiming to turn around at 75th street for a nice out and back. 136th and 116th whipped by. The next thing I knew I was at the tunnel near 96th street. I was tired but I was in familiar territory. I had run the same route for my 17 miler save for the extra 2.5 miles at the beginning. Then I was at 75th street again. I was ready to turn around and when I did, I came to face that little 5-8 mph breeze…and it stopped me cold, literally. The breeze had been behind me and now I felt it fully on my head and chest. I wear a camel back for water on long runs and it had been protecting me from the cold plus you all know it feels different when the wind is at your back. Not nearly as cold. By the time I got back to 86th street I was at 12.5 miles…and 7.5 miles away from home. A knot had formed behind each of my knees and I was chilled to the bone from my own sweat. I was in bad shape. I had tried a run/walk routine for a bit from 75th to 86th street, but it wasn’t working. My hips and legs were done. Normally I run a 10 minute mile. I was 20 minutes off the pace for the 12.5 miles I had run so far. This is when you realize there is no shame in knowing when you’ve had enough and a 12 mile run is good enough when the temperature is still in the low 30s. So I want to talk about limitations and listening to your body. I hate to admit it but that little voice in my head (we all have it) had tried to talk me out of running in 25 degree weather. I ignored it though….it was just a little cold out after all. Buck up, be a man and go run! People run in the cold all the time! You have the right gear so “just do it”! When I had passed my gym at mile marker #3 that voice had told me to finish up the remaining 17 miles inside on the treadmill. I could see the front doors of the nice warm gym! Again, I ignored the voice. I was doing okay, just a little off pace…it WAS cold so it was to be expected. When I had crossed 111th street that same voice tried compromise instead of all out orders. The suggestion came to turn around at 96th street instead of going on down to 75th. I could loop closer to my car “just in case”. A third time I ignored the voice of reason. Heck, I was just 2 miles from the turn around and I would be headed home! No worries right? Right??? I only heard from that voice one more time the whole day and that was when I limped back up to 86th street near the grocery store. “I told you so.” is all that little voice said. I hate that voice. He can be a real jerk sometimes. I think it’s great to push and challenge yourself. I do it all the time. I regularly test my one mile best time, I’ve ran two half-marathons only two weeks apart, I’ve ran a 5K race at 7am and a half-marathon that same night at 10pm. I’m signed up to run a full marathon now and I have plans to run The Goofy Challenge in the future which will have me running a half and a full marathon on consecutive days. I’m not sure if I’ll ever want to do an ultra, but we’ll see. 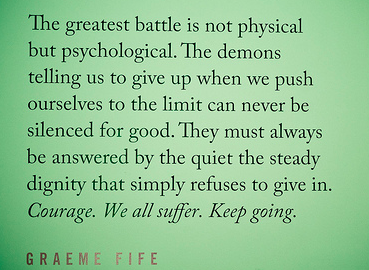 Challenging yourself is good. Regardless, it’s important to train well, know your limitations, still push it a bit, but remember to listen to what your body is telling you and know the difference between an ache and a pain. Had I just looked at the evidence on my Garmin watch I would have turned around early and finished at the gym. And I WOULD have finished! By mile 7 or 8 I was 20 minutes off my regular pace and I certainly wasn’t going to pick up speed on the last half of my first 20 mile (near-zero degrees) out and back. Now I can’t wait to get back out there, run in the cold some more with my new Under Armour (it worked great by the way) and allow my body to acclimate to the lower temperatures while still delivering a good performance! I didn’t fail, I just learned something new! This coming weekend I have a 22 mile run on Saturday and I can’t wait! Weather permitting I’ll do much of the run outside, but I’ll also be listening closely to how I feel so if I need to duck in and finish on the treadmill I can. The distance is more important than the location for these last few long runs before my first full marathon January 9th!